Life and Death – Zombies! I freely admit that I have a thing for the Undead in the same way as some fantasy gamers have a big thing about orcs and other green skinned monsters. 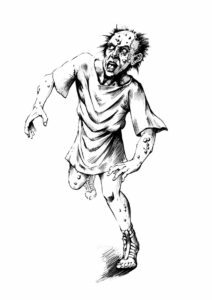 Rather than splurge on the various Zombie RPGs that have come out since the 90s, I’ve always channeled my love of these undead through my own adventures. 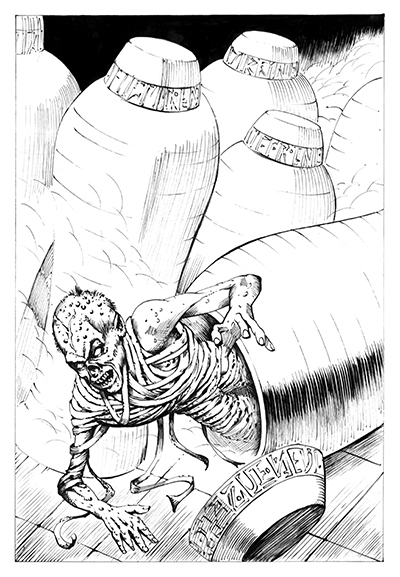 My upcoming re-released Life and Death Zarth Edition, for Crypts and Things and other OSR RPGs, really is my fantasy tribute to the films of George A. Romoro. 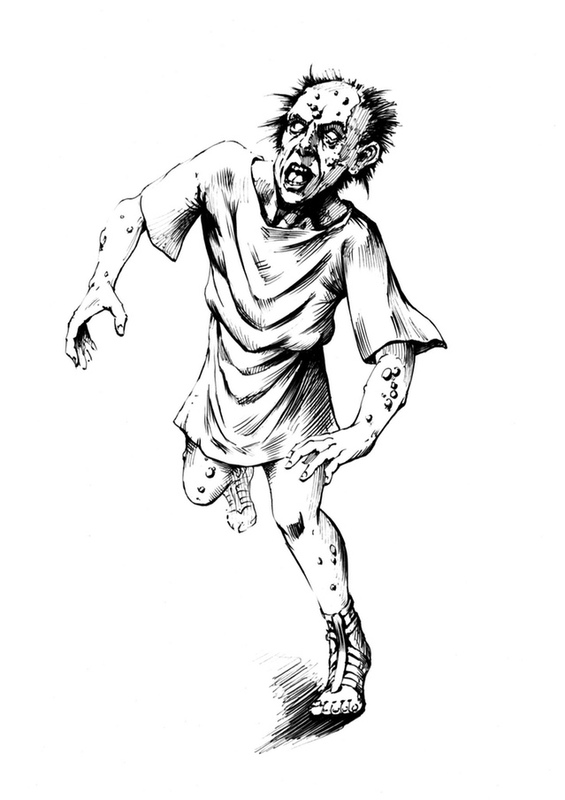 This first Zombie is encountered in the second adventure of this four adventure collection. 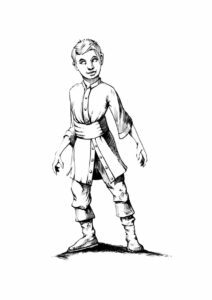 He is recently deceased, like the rest of the Zombies encountered in the old Sorcerer’s Tower that forms the basis of Dust of Eternity, and like a cruel joke his previous personality and some memories linger in his now dead body. 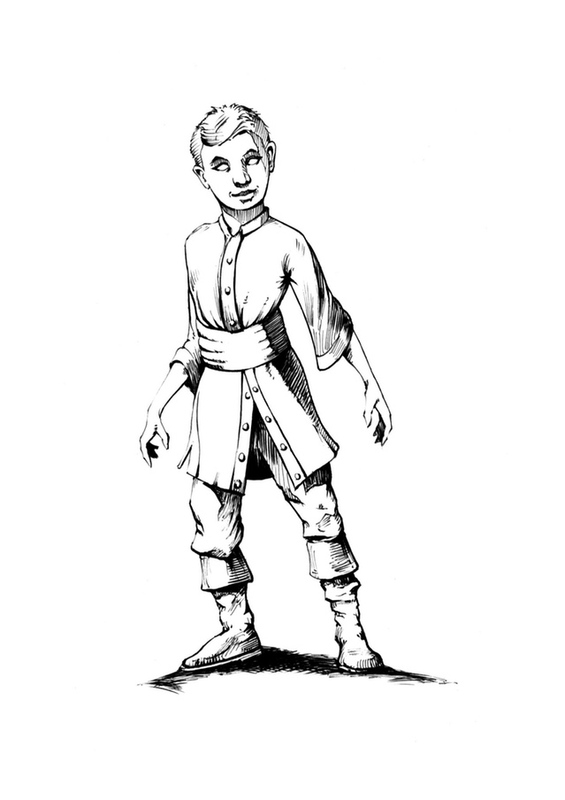 The Dust of Eternity is a low-level introductory adventure, but one I intended to show the principle of Monsters are People too even the Zombies who normally lack a personality. The inspirations came from the fact that I had recently been playing Bioshock – where in the the sunken city of Rapture its inhabitants have been turned into mockeries of their formerselves by the use of biogentics, yet still remember their former life and go around moaning and lamenting about the humanity and relationships they had lost. The idea of a dead civilization that choked to death on its own evil practices thousands of years previously has always tickled my fancy. The third adventure Dead Pot Country explores this theme as the adventurers venture into dried up river valley and wander through the ruins of a once glorious civilization. A civilization that buried its dead in large pots in fields surrounding its main city…a practice that leads to minefield of danger when the undead inhabitants of said pot burials come back into the light of day. I always liked the idea of Zombies as victims and embodiment of a viral plague, and this theme is played out in the final adventure, Life and Death, where the city of Miraz is in the grip of a plague whose victims are resurrected as shambling undead like the one pictured below. Miraz is in many ways is an ancient Mesopotamian city state complete with mudbrick houses and even a Ziggurat which is home to the God-Tyrant of the city. The plague is symptomatic of the collapse of order that the city is undergoing when the adventurers arrive in the city. Not only has the Tyrant lost control of a third of his city to the plague, but his sons are at war with each other and a rebellion amoung the peasants is brewing. Life and Death Zarth Edition is currently in the final phases of production and is due out April/May this year. This entry was posted in Crypts & Things, Fiendish Friday, General by Newt. Bookmark the permalink. This sounds awesome! Any idea when you are realeasing it? Looking end of May/beginning of June.